This presumed domain is named after Emsy N Terminus (ENT). 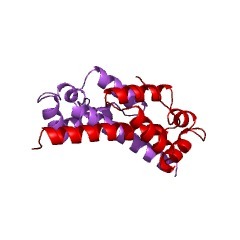 Emsy is a protein that is amplified in breast cancer and interacts with BRCA2. 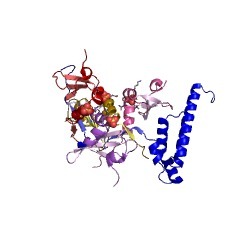 The N terminus of this protein is found to be similar to other vertebrate and plant proteins of unknown function. This domain has a completely conserved histidine residue that may be functionally important. 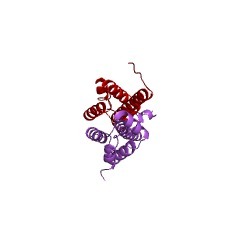 The EMSY N-terminal (ENT) domain is a ~90-residue module, which is unique in the human proteome, although multiple copies are found in Arabidopsis proteins. In the plant proteins, the ENT domains are accompanied by Agenet domains, plant specific homologues of Tudor domains [(PUBMED:14651845), (PUBMED:12575993)]. The ENT domain consists of a unique arrangement of five alpha-helices that fold into a helical bundle arrangement. Overall, the three-dimensional structure adopts a club-like shape that consists of an extended N-terminal alpha-helix that connects to a helical bundle substructure. The ENT domain forms a homodimer via the anti-parallel packing of the long N-terminal alpha-helix from each subunit [(PUBMED:15978617), (PUBMED:15947784)]. There are 2347 ENT domains in 2318 proteins in SMART's nrdb database. Taxonomic distribution of proteins containing ENT domain. This tree includes only several representative species. The complete taxonomic breakdown of all proteins with ENT domain is also avaliable. Click on the protein counts, or double click on taxonomic names to display all proteins containing ENT domain in the selected taxonomic class.